It’s turkey month. At least here in the United States, anyway. The turkey is the biggest star of the Thanksgiving table, which is why I want the recipe I share with you this year to be a complete show stopper. This recipe has a homemade herb rub that you can easily make ahead of time- no problem! You can also sub for already made herbs as well, but sometimes fresh herbs are a great way too go if you can get your hands on them. My neighbor, Cindy, so kindly created this recipe for us. She is an incredible cook and has a garden filled with fresh sage and rosemary and put this recipe together, and trust me, it is AMAZING! The best way we have found over the years to really get the flavors of your seasonings is to stuff them between the skin and meat prior to cooking. The skin entraps the flavor and it really seeps into the meat to make each slice extremely flavorful. 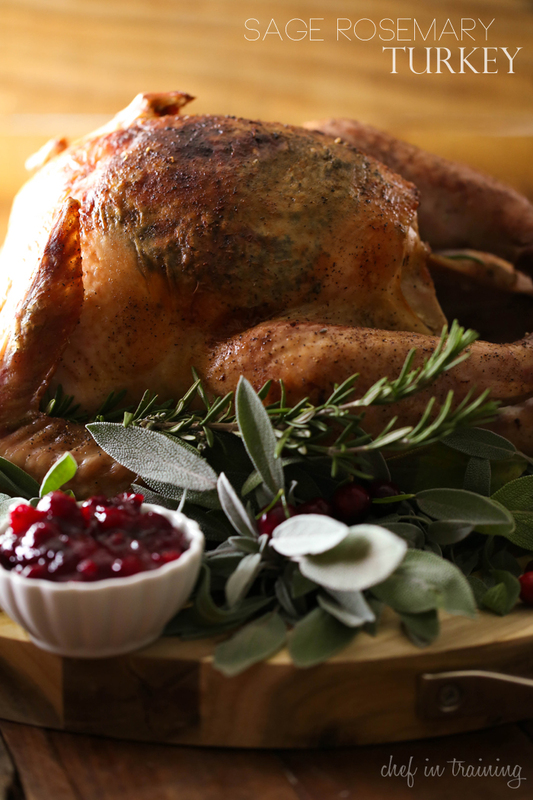 This turkey would make a great starring role to your Thanksgiving menu! Spread herbs evenly on a cookie sheet. Bake at 250 degrees F for 4 hours to dry herbs. Once herbs have dried, combine with coarse sea salt in food processor to grind dried herbs and salt to desired consistency. Wash Turkey. Take out neck and giblets. Put on rack in Roasting Pan. Put hand in between skin and breast meat to separate. Mix ¼ cup softened butter, 2 Tablespoons blended herb salt, minced garlic and thyme in a small bowl. Put under skin on top of breast. Sprinkle pepper all over turkey. Cut ⅛ cup cold butter into tabs and put on top of turkey. Place turkey in turkey bag and follow the directions for bag. Cook turkey at 325 degrees F for about 3 hours. When the turkey has about 30 min left, cut plastic bag on top and open bag so that turkey can brown. Cook until turkey is done and cooked through properly. Baste with juices. Let turkey sit 30 minutes before carving. What a gorgeous picture! Your post this week have me excited for Thanksgiving! What a pretty picture and I hope you and your family have a great Thanksgiving even though I'm pretty sure you've been living it for awhile now with all these pre- Thanksgiving posts and recipes! And how nice to have a neighbor with fresh sage and rosemary! Thank you for the nice and simple recipe for Turkey. Have a Great Day and Week.